The H5P conference, 5th-7th December 2018 in Melbourne, promises to be a great event, and it’s a chance for you to catch-up with Managing Director of HRDNZ (the organisation behind ElearningWorld) in person! 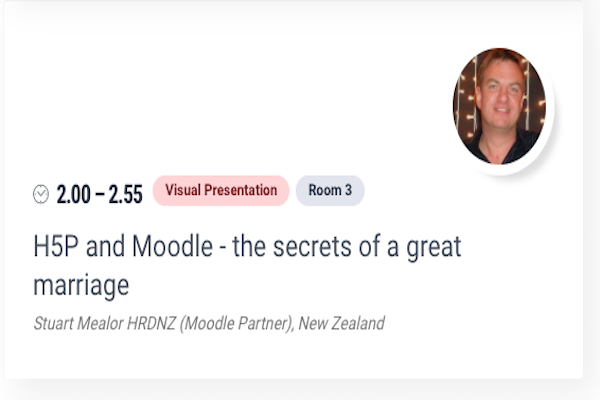 Stuart’s presentation “H5P and Moodle – the secrets of a great marriage” is scheduled for Day 1 (5th December) 2.00pm-2.55pm. As a highly experienced and relaxed international speaker, Stuart’s presentations are informative, sometimes controversial or at least thought-provoking, and delivered in his unique relaxed and personable style. Of course he loves to meet other Moodle users during the conference, and over a meal or beer afterwards(! ), and at this conference especially if you are using H5P with Moodle. ← Are you using the Moodle App?